Prior to last Sunday's night's game between the Pittsburgh Steelers and Green Bay Packers, yours truly added wideout Martavis Bryant as a desperation add when New York Giants receiver Sterling Shepard was forced to miss his second straight game with migraines. With JuJu Smith-Schuster missing the game with a bum hamstring, Bryant became a decent late play and ultimately it paid off as he picked up a TD reception and nearly scored a second on an end-around rush. Unfortunately, it looks like it will be a one-week deal for Bryant in terms of fantasy football value as Smith-Schuster will make his return this Sunday. With Smith-Schuster and Antonio Brown taking up the lion's share of targets from QB Ben Roethlisberger, Bryant is left to just WR 4/5 standing. In other words, bench him outright. After a string of summers where invariably attention would turn to the status of Cleveland Browns ace wideout Josh Gordon and his potential as a fantasy football sleeper, his much-awaited return will take place this Sunday as he finally was reinstated by the team a few weeks ago. By now everyone knows the story here about how top tier receiving talent Gordon was suspended by the NFL for endless drug busts and now at the age of 26, he has vowed to stay clean and take hold of his career again. In terms of fantasy football, Gordon has always carried quite a bit of allure as he once caught 87 balls for 1,646 yards and 9 scores in 2013 but he has not been on an NFL field since midway in the 2014 season. There will clearly be quite a bit of rust for Gordon to work off and he returns to a Browns team that has an ascending receiving talent on their hands in the form of second-year man Corey Coleman. In fact you can make the argument that Coleman is the more valuable player in terms of present-day fantasy football potential and the Browns also have emerging tight end David Njoku and supreme pass-catching back Duke Johnson around as well. Throw in the brutal rookie campaign so far of QB DeShon Kizer and Gordon is looking like nothing but a speculative bench wideout for the time being. Yes Gordon is now just moving toward his prime years and the talent will likely still be very evident. However expecting him to go right back to WR 1 status is foolish at this stage of the game and he at the most should be slotted as a WR 3 with good upside. First a one-game suspension for fighting and then the loss of starting QB Jameis Winston conspired to make it a very trying last month for Tampa Bay Buccaneers ace wideout Mike Evans. Drafted in the middle of the first round in most fantasy football drafts this past summer, Evans has seen his numbers crater this season compare to his monster 2016 campaign (96 catches, 1,321 yards, 12 TD). Heading into Week 13, Evans sits with a disappointing 51 catches for 702 yards and 4 scores and over the last month he has performed like nothing but a WR 3. The good news however is that Evans will get back Winston this week as the latter returns from his shoulder injury. While Winston has his own worts, the one thing that is obvious is that he loves looking Evans' way and the two should instantly go back to being very bust in the passing game. Thus, Evans should graduate right back to WR 1 status and just in time as the fantasy football playoffs wait. While the totality of Evans' season is going to be below summer expectations, the end could be potent. It would be a gross understatement to say the Dallas Cowboys offense has struggled since top running back Ezekiel Elliott began serving his six-game suspension two games ago. With no running game to fear, opposing defenses are daring second-year QB Dak Prescott to beat them with the pass; which to this point he has failed miserably at. We are getting a firm look at why Prescott dropped to the fourth round of the 2016 NFL Draft as his pure passing skills are lacking and completing third-and-7 passes is becoming quite the chore as opposed to his old third-and-2 throws. The fallout not only includes a depreciated Prescott in the fantasy football world but also wideout Dez Bryant who has put up nothing but WR 3 numbers the last two games. While Bryant did catch 8 balls in Week 11, they went for just 63 yards and then last week he was virtually a non-factor with 3 catches for 37 yards. Now Bryant draws a brutal CB assignment for Thursday Night Football in the form of top Washington Redskins lockman down Josh Norman and that alone is a big problem for the Cowboys wideout's numbers. With this being the last week of the regular season for many fantasy football leagues, it is imperative that every move is scrutinized and those who own stock in Bryant needs to really look hard at benching him outright given the Norman assignment. While Bryant remains an incredibly gifted athlete, Norman can easily shut him down given the struggles of Prescott and you can even make the case Terrance Williams is the best receiving option for the Cowboys this week. Ultimately it is a 50/50 call but if you have the depth, benching Bryant is not a crazy option. Maybe Ben McAdoo is trying to get himself fired. There is no other possible explanation after he revealed Tuesday that starting QB and two-time Super Bowl winner Eli Manning would be benched but not for rookie Davis Webb to take a look at his upside. Instead Mannning is being benched for Geno Smith who as we all know was a comically inept passer during his ill-fated New York Jets tenure that was lowlighted by him suffering a broken jaw after being punched by a teammate. Manning will now take a seat after 210 consecutive starts and you have to think his time with the Giants will be through at the end of the year despite having two more years left on his deal. There is almost no way Manning is not royally ticked off by the move and the fantasy football owners of wideout Sterling Shepard and tight end Evan Engram are annoyed as well since Smith is garbage. Downgrade both Shepard and Engram in fantasy football for Week 13 and Manning can be dropped everywhere. Meanwhile the once-proud Giants have become the laughingstock of the NFL. After a slow start to the season amid heightened expectations, Oakland Raiders QB Derek Carr has performed like the QB 1 that many anticipated over the last month. The good times may not keep rolling into Week 13 however due to some injury/misbehavior issues that could decimate the Raiders' receiving corps versus the New York Giants. While a tasty matchup for Carr on paper, top wideout Michael Crabtree has already been suspended for two games due to the nasty fight he engaged in with Denver Broncos QB Aqib Talib last week and fellow starter Amari Cooper's status is also murky after he suffered a concussion in the same game. So now what we have here is a scenario where Carr could be without both Crabtree (a certainty) and Cooper (a possibility) which makes banking on him to put forth big numbers in a clinching week in fantasy football could be asking a lot. In addition, third receiver Seth Roberts becomes an immediate person of interest if both Crabtree and Cooper are out as he would likely see a major uptick in targets along with tight end Jared Cook. Both guys would be worth starting in all fantasy football leagues under that scenario but this is a fluid situation which bears watching the rest of the week. Amazing we are already at fantasy football Week 13 and so let's see who makes the latest grade in terms of waiver wire additions. Eli Manning: Look for Manning to get back ace wideout Sterling Shepard just in time to take advantage of a weak Oakland Raiders secondary which has been burned all season. Dede Westbrook: A forgotten man since he missed the first ten weeks of the season due to abdominal surgery, Dede Westbrook hit the ground running in Week 12 with 10 targets from QB Blake Bortles. While Marqise Lee remains the top target of Bortles, Westbrook has the most ability of any Jags wideout and should be owned everywhere. Josh McCown: McCown has appeared in this space on numerous occasions this season and it speaks to the nice year he is having, while at the same time the hesitancy of many in the fantasy football community to embrace the journeyman. He gets the brutal Kansas City Chiefs secondary in Week 13 and is coming off another 3-TD effort this past Sunday. Zay Jones: It might be a long shot for Kelvin Benjamin to return to the Buffalo Bills this week and so Zay Jones will once again dominate looks from motivated QB Tyrod Taylor. Martavis Bryant: JuJu Smith-Schuster is far from a guarantee to make it back for Week 13 from the hamstring injury that knocked him out for Sunday night's win over the Green Bay Packers and Martavis Bryant played well in his place. Bryant scored on a TD catch and also should have scored on a reverse as well as he looked very explosive. The Steelers offense is clicking on all cylinders now and Bryant is very much a part of it. Ricky Seals-Jones: Out of the blue has been rookie Arizona Cardinals tight end Ricky Seals-Jones who has caught three touchdown passes the last two weeks. That coincides with TE-loving QB Blaine Gabbert and so this could be the kind of under-the-radar late season move that can win leagues. Los Angeles Chargers Defense: The Chargers coming off an insane destruction of both the Buffalo Bills and Dallas Cowboys on defense and now draw the mistake-prone Cleveland Browns. Sign us up sir. -Julio Jones meet the end zone. The Atlanta Falcons ace wideout has long frustrated his fantasy football owners with his lack of scores but he managed to get into the end zone TWICE Sunday in a dominant performance. Overall Jones hauled in an insane 12 balls for 253 yards and two scores in dominating the Tampa Bay Buccaneers secondary. The two scores only make it three total touchdowns for Jones this season which is ridiculous considering the talent but his owners will take it. -Other than Russell Wilson maybe, now QB has been more consistently dominant than the Philadelphia Eagles' Carson Wentz. Wentz went to town on the Chicago Bears defense Sunday by completing 23-of-36 throws for 227 yards and 3 touchdowns. That brings his season total to 28 with just 5 picks in what is becoming a fantasy football MVP campaign. -While he has been solid at times this season, Indianapolis Colts QB Jacoby Brissett was miserable Sunday as he completed just 17-of-29 throws for 196 yards with no scores. He added 16 yards on 3 carries but took a ridiculous 8 sacks. Brisset has no pocket awareness and can't read defenses adequately which again calls into question the viability of any Colts skill player outside of maybe tight end Jack Doyle. Doyle was a decent safety valve as he hauled in 7 balls for 94 yards and in PPR formats he has been good but Brissett's ugly play hurts the TD potential. Driving this point home is the fact Colts top wideout T.Y. Hilton managed just two catches for 15 yards in a horrific outing. Hilton can't be trusted in any given week and the best course of action is to bench him outright. -Cincinnati Bengals rookie running back Joe Mixon was the talk of the fantasy football world during the summer as he drew Ezekiel Elliott comparisons but he has been a gigantic bust leading into Week 12. However Mixon finally put forth a nice outing as he rushed for 114 yards and a score on 23 carries, while adding 3 catches for another 51 yards. The speed has always been apparent but the instincts have bee noticeably absent and he draws a tough Pittsburgh Steelers run defense next week. -Eagles wideout Alshon Jeffery remains a huge TD producer as he hauled in his fifth scoring pass in the last four games Sunday. Altogether Jeffery caught 5 balls for 52 yards and a score and the health has been on par as well which is not to overlooked for the frail wideout. Mostly a WR 2 now after flashing as a WR 1 early in his career with the Chicago Bears, Jeffery is doing his best work at the most important time of the season. -Wow has Jay Ajayi been a huge bust no matter the locale. The Eagles back rushed for just 26 yards on 5 carries Sunday, while adding only 1 catch for another 7 yards. It appears as though Corey Clement and LeGarrette Blount are taking hold of the running back reigns from Ajayi and that means he doesn't even carry RB 3 value. What a brutal season. -Falcons running back Tevin Coleman rushed for 97 yards and two scores on 19 carries Sunday as he continued to show he is very capable of being a bellcow back with Devonta Freeman out. While he did not catch a pass, Coleman will be a low-end RB 1 as long as Freeman is out. -Speaking of Blount, the bruising Eagles back rushed for 97 yards on just 15 carries Sunday as he completely overshadowed Jay Ajayi. Blount remains mostly a FLEX play but he is simply not going away for those who own stock in Ajayi. -Corey Davis remains nothing but potential as Tennessee Titans QB Marcus Mariota and he are not on the same page. Davis hauled in just 4 balls for 39 yards Sunday despite the fact Rishard Matthews was out injured. While Davis is quite intriguing, the results are simply not there. -The Pittsburgh Steelers offense is virtually unstoppable right now and anyone who owns share from this group should feel very lucky heading into the fantasy football playoffs. Running back Le'Veon Bell showed why he is the number 1 player in fantasy football by a mile as he rushed for 95 yards on 20 carries, while adding an extreme 12 catches for another 88. While the touchdowns have been a bit scarce, Bell has been insanely productive since working off the rust in September. He is the premier weapon to be holding in your holster as the playoffs weeks arrive. -Not to be outdone, Steelers QB Ben Roethlisberger tossed four touchdown passes for the second week in a row as part of his 33-of-45 day for 351 yards. While he did toss two interceptions, the Steelers passing attack and offense as a whole looks like the old Kurt Warner St. Louis Rams. While Big Ben was pretty mediocre in Sept. and Oct., he is now back to being a top every week starter. -Every week Steelers wideout Antonio Brown leaves our jaw on the floor given how insanely great a wideout he is. Sunday night was no different as Brown caught 10 balls for 169 yards and two more touchdowns. Over the last two weeks Brown has gone extra nuclear with 20 catches and 5 touchdowns and so while Julio Jones and Odell Beckham may challenge, there is no no doubt who the top wideout in the game is. -Dede Westbrook took advantage of Marqise Lee catching just one ball to see 10 targets and 6 catches from QB Blake Bortles on Sunday for the Jacksonville Jaguars. With a leaky Indianapolis Colts defense on tap for Week 13, Westbrook could be worth a WR 3 look. -It was a rare off week for Arizona Cardinals wideout Larry Fitzgerald who snagged just 3 passes for 12 yards in the team's win over the Jaguars. Nothing to see here in terms of Fitzgerald's status changing in terms of fantasy football however as it was simply just an off day. -Speaking of Marqise Lee, catching one pass for just 13 yards was a direct result of being covered by Cards CB Patrick Peterson. Guys like Peterson and Josh Norman can completely eliminate an opposing wideout no matter how talented and so that always needs to be looked at in terms of fantasy football. As far as Lee is concerned, he remains a solid WR 3 in PPR formats only. -Ricky Seals-Jones is becoming a person of interest in fantasy football tight end circles as he snagged four balls for 72 yards and one score Sunday. Seals-Jones has now caught three touchdown passes the last two games and his production has coincided with the ascension of tight end0loving QB Blaine Gabbert. Check this one out if you are in TE production. -Jaguars running back Leonard Fournette seems to have hit the same rookie wall that the Kansas City Chiefs' Kareem Hunt plowed into as he rushed for 25 yards on 12 carries, while adding 3 catches for another 17 yards Sunday. November has been an ugly month for Fournette who seems to be on fumes and is now a somewhat shaky fantasy football option when the stakes are the highest. You almost have to roll with Fournette at this point unless you have a good third back but the trends of rookie backs hitting the wall in November is looking like something to be aware of moving into the following season. -Los Angeles Rams wideout Sammy Watkins could be a major player the rest of the way now that Robert Woods is out injured for the team. Watkins stepped into the role of number 1 wideout Sunday by hauling in 4 balls for 82 yards and a score from QB Jared Goff. Nothign earth-shattering but it is a step forward for Watkins who has been pretty brutal in 2017 to this point. He is back on the WR 3 radar. -Blake Bortles was terrible again on Sunday as he completed 19-of-33 throws for 160 yards with 0 passing scores and one pick. Bortles did rush for two touchdowns and 62 yards total on 6 carries but it is a reminder of just how miserable a passer he is. -Cooper Kupp reached 100-yards receiving in a game for the first time in his career Sunday by catching 8 balls for 116 yards. While the Rams wideout has not exactly lived up to the summer hype, he generally has yielded consistent enough numbers to hold WR 3/4 value. -Russell Wilson kept up his fantasy football MVP performance Sunda as he completed 20-of-34 throws for 228 yards with 2 TD's and one INT. He added a rushing score as well on 7 carries for 25 yards as he toyed with the brutal San Francsico 49ers defense. Wilson simply can't be held back in any given week in fantasy football and he is as hot as anyone in the game right now. -Putting an ugly first half of the season fully behind him, Oakland Raiders QB Derek Carr was very good again Sunday in completing 18-of-24 throws for 253 yards and 2 touchdowns. The one thing that needs to be watched closely here though is that Amari Cooper exited with a concussion and Michael Crabtree could be facing a suspension for fighting which would hurt the outlook on Carr in Week 13. -Jared Goff added another layer to his excellent sophomore season as he completed 28-of-43 throws for 354 yards with 2 TD's and 1 INT. Goff gets another good matchup next week versus the leaky Arizona Cardinals defense and so he should remain on the QB 1 radar. -Nothing can stop New Orleans Saints rookie running back Alvin Kamara as he hung another ridiculous performance on the board Sunday by rushing for 87 yards and a score on just 5 carries., while adding 6 catches for another 101 yards and a score. Incredibly stuff here but we have been saying this on a weekly basis since October. 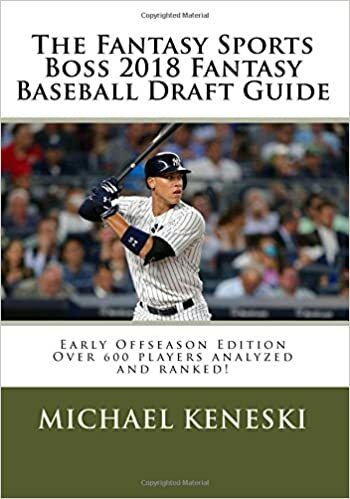 THE FANTASY SPORTS BOSS 2018 FANTASY BASEBALL DRAFT GUIDE MAJOR SALE!!!!! Here are the fantasy football Week 12 wide receiver rankings based on opposing matchups. Here are the fantasy football Week 12 running back rankings based on opposing matchups. The injuries are piling up in fantasy football as we head down the stretch and so here are the latest news items to be made away of. -Tennessee Titans wideout Rishard Matthews is questionable and unlikely to play Sunday due to a recently developed hamstring strain. Late week downgrades almost always result in a seat on the bench and Matthews sitting out means rookie Corey Davis has his best chance yet to dominate looks from struggling QB Marcus Mariota against a forgiving Indianapolis Colts defense Sunday. Start Davis everywhere. -Denver Broncos wideout Emmanuel Sanders is questionable with an ankle injury but word is he will be out there for Paxton Lynch's first start of the season. Considering how bad the QB play been from the Bronco passers this season, Sanders is nothing but a shaky WR 3 this week even without the injury. -Houston Texans wideout Will Fuller will be not go Sunday as he has been ruled out for the second week in a row with a rib injury. That means Bruce Ellington is worth another look in PPR formats but he is not looking as great a play this week as he was last when DeAndre Hopkins had to deal with Patrick Peterson. -Kenny Stills owners had to be jumping for joy when they saw that Miami Dolphins QB Jay Cutler would sit out with the concussion suffered last week. That means Still's BFF Matt Moore will be under center and the two have been a tremendous connection in the limited time they have had to play with one another this season. Start Stills everywhere. -All systems are a go for Colts QB Jacoy Brissett who was removed from the injury report after clearing concussion protocol. Brissett has played quite well this season replacing the recovering Andrew Luck and at the very least he has cemented himself as a good backup next season. -Atlanta Falcons wideout Julio Jones was removed from the injury report as his ongoing knee and ankle woes seem to have abated for now. -Jamaal Williams will be the bellcow back for the Green Bay Packers this week once again as fellow runner Ty Montgomery is out with ongoing pain in his bruised ribs. Williams is nothing but a low-end RB 2 in standard leagues based on volume alone as he has not impressed as a runner. -Yet again Seattle Seahawks tight end Jimmy Graham is listed as questionable this week but the gy draws that tag almost every week and goes out to play on Sunday. Graham has been locked in as a major TD producer the last month of the season and he should be started with full confidence. -There will be no Pittsburgh Steelers rookie wideout JuJu Smith-Schuster Sunday as he will sit with a hamstring injury. This is tough timing as Smith-Schuster has been really good the last few weeks but the emergence will have to wait at least as week. Thanksgiving has come and gone and two out of the three games were absolute dud/slopfests. Included was the requisite fantasy football happenings as we detail below. -It took half the season but it looks like Washington Redskins wideout Jamison Crowder is ready to realize the vast PPR potential he carried coming into the season. The Redskins first had to realize that Terrell Pryor was an imposter and Crowder himself needed to get healthy after some early dings. The last two weeks have been big though as Thursday night Crowder was the star for the Redskins as he caught 7 balls for 141 yards and a score in the team's win over the NY Giants. Crowder is operating out of the slot right now and QB Kirk Cousins seems completely locked in on him right now which means the numbers should continue to flow in a big PPR way. The funny thing is that in many cases, Crowder's current owners are different from those who originally drafted him. -With Giants wideout Sterling Shepard out with more migraine issues, it was expected that tight end Evan Engram would see an insane amount of targets. Well that simply did not happen as Engram caught just three passes for 18 yards in a no-show performance Thursday night. Despite the setback, Engram has been tremendous in his rookie season and already has the look of being the next great receiving tight end in fantasy football. Continue to queue him up next week. -Samaje Perine has now reached the 100-rushing mark for two games in a row as he went for 100 on the nose on 24 carries, while adding 3 catches for another 30 yards in the win over the Giants. Perine has clear ball security issues though and his overall average is not great but he is now a clear bellcow back going into the fantasy football playoffs. -Evan Engram had company in terms of being a tight end dud on Thursday; with the Redskins' Vernon Davis bettering him with ZERO catches in the game. Davis had been very good the last two weeks in place of the injured Jordan Reed but he had nothing going Thursday night. Still Davis is worth using again next week if Reed were to sit out again. One of those days. -The Los Angeles Chargers need to make a concerted effort to get tight end Hunter Henry more involved as he continues to show big-time ability. Henry went off Thursday against the Dallas Cowboys by catching 5 balls for 76 yards and a score. It is old news how Henry has not been utilized as much as he should and that makes him an every week risk in terms of fantasy football. -Philip Rivers was playing catch in the park Thursday as he was flawless in completing 27-of-33 throws for 434 yards and 3 touchdowns in the win over the Cowboys. Rivers remains one of the most underappreciated players in all of fantasy football as the numbers flow each and every season in a major way with little fanfare. -Melvin Gordon remains a RB 1 imposter on skill but not on volume as he picked up 65 yards rushing on 21 carries, while adding 3 catches for another 23. It is painful to watch Gordon at times given how ordinary a runner he is but he continues to see a very high amount of looks in an explosive offense. -Cowboys QB Dak Prescott is starting to really show why he was an unheralded fourth round pick in 2016 as he put forth a third straight dud Thursday by completing 20-of-27 throws for 179 yards with zero TD's and 2 INTs. With no Ezekiel Elliott to help take pressure off in the run game, Prescott has to lead the offense with his pure throwing which as we have seen leaves a lot to be desired. Any Prescott owners who were even still using him in fantasy football should bench him outright. You also have to wonder if Dallas higher-ups are questioning if Prescott can be the QB of the future. -Keenan Allen my goodness. For the second straight week, Allen was insanely productive as he caught 11 balls for 172 yards and a touchdown in the win over the Cowboys. Having gone crazy last week as well, Allen is showing why he was so highly coveted prior to 2016 before an ACL injury knocked him out in Week 1. In PPR formats, Allen is now knocking on the WR 1 door and his fantasy football owners have to be feeling extra thankful they have him on their roster moving forward into the remainder of the season. -Detroit Lions running back Ameer Abdullah could find himself glued to the bench soon if he keeps on fumbling. Abdullah lost another fumble Thursday and all in all was ineffective in rushing for 14 on 6 carries, while adding 3 catches for another 29. Without the catches, Abdullah would be worthless in all fantasy football leagues but he holds some RB 3 value in PPR on that skill alone. Either way, you don't want to be depending on Abdullah down the stretch if possible. -Minnesota Vikings wideout Adam Thielen once again makes his space as he does almost every week. What a monster season Thielen is having, which he further validated by catching 8 balls for 89 yards in the team's win over the Lions. Thielen has already crossed the 1,000-yard receiving mark with five games to go and it speaks to how he is pretty much now a WR 1 in all formats. -Vikings tight end Kyle Rudolph remains a very underrated red zone tight end as he caught two more touchdown passes Thursday as part of his 4-catch day for 63 yards. Rudolph is as dependable as they come but in a very unheralded way for the Vikings and this season has been no different. While the raw total catches have never overwhelmed anyone, Rudolph should be started every week the remainder of the season. -Lions wideout Marvin Jones was big Thursday as he caught 6 balls forr 109 yards and two scores. Jones remains boom-or-bust from week-to-week given the presence of Golden Tate and Kenny Golladay but his TD potential outweighs both. -Matthew Stafford shook off an ankle to gut out a 20-for-35 day for 250 yards with 2 TD and 1 INT. Once again, Stafford did his best work in the fourth quarter and this time when the Vikes were playing a prevent. Be that as it may, Stafford has been a slam-dunk QB 1 all season and that won't change the rest of the way. -Case Keenum simply can't be taken out of the starting lineup for the Vikings as he played great again Thursday in completing 21-of-30 passes for 282 yards with 2 TD and 1 rushing score. Keenum has been one of the most spectacular out-of-nowhere success stories this season and he should keep Teddy Bridgewater planted on the bench for now. At the very least, Keenum has set himself up for a payday for some QB-needy team in 2018. It was more of the same excellence for Seattle Seahawks QB Russell Wilson who is in the midst of an MVP campaign, while Atlanta Falcons QB Matt Ryan continued to pull himself from an early seasom fog. -Speaking of Wilson, he is really doing some amazing things this season and his passing/running skills have forcefully put the previous run-heavy aspect of the Seahawks offense firmly into the past. Monday night was more of the same as Wilson completed 26-of-42 throws for 258 yards with 2 TD and 1 INT, while adding 7 carries for 86 yards and another score. Wilson did turn it over twice (lost a fumble to go with the INT) but his production has been off the charts since mid-September and the case can be made that he is the best QB in fantasy football right now. On the other side, Ryan stretched his string of throwing at least two TD's a game to four as he completed 19-of-27 throws for 195 yards with the two scores. While the yardage has not been overly impressive on a week-to-week basis, Ryan should be back in the good graces of his fantasy football owners and he gets a plush assignment next week versus the Tampa Bay Buccaneers. -With Devontae Freeman missing the game with a concussion, Tevin Coleman finally got a chance to show what he could do as a bellcow back. Overall Coleman was just all right as he picked up just 43 yards on 20 carries but did manage to score. He also contributed just one catch for 15 yards in the overall average outing. Freeman is expected to return this week however which puts Coleman back into RB 3/4 territory. The Seahawks meanwhile tried a fresh face at running back to try and see if anyone on the team can put up even average numbers. This time it was former San Francisco 49ers castoff Mike Davis but he managed just 6 carries for 18 yards and 2 catches for another 41 before leaving with a groin injury. With Thomas Rawls scratched and Eddie Lacy (2 yards on 3 carries) showing he should not be in the league any longer, maybe finally J.D. McKissick (7 carries for 30 yards, 5 catches for 23) will get a much-deserved chance. McKissick has really hinted at big-time ability and he should be added where available. -On the receiving side of things, Jimmy Graham caught his weekly TD as part of his 7-catch and 58-yard night. Graham has not looked this good since his healthy New Orleans days and he is putting together a tremendous year. While he did score a TD himself, wideout Doug Baldwin was relatively quiet with just 2 catches for 40 yards as Paul Richardson (5 for 56) took the lead at the position in this one. With regards to the Falcons, Julio Jones continues to gut it out with various injuries to catch 5 balls for 71 yards but once again he failed to score. That scoring went to Mohamud Sanu who managed 3 catches and 34 yards. Not a great day by any means for the Falcons wideouts but both guys are weekly resources. So maybe THAT is why Dallas Cowboys QB Dak Prescott was a fourth-round pick? By the time you finished reading the previous sentence, Prescott might have thrown another interceptions versus the Philadelphia Eagles. Simply put, Prescott was beyond brutal Sunday night as he completed just 18-of-31 passes for 145 yards with zero touchdowns and three interceptions in the team's 37-9 whitewash against the Eagles and the start was the second in a row where the guy performed horribly. Of course in both of those starts Prescott was without both All-Pro left tackle Tyron Smith (injured) and All-Pro running back Ezekiel Elliott (suspended) which surely contributed to the carnage. However the fact of the matter is that Prescott has not shown himself to be an even adequate passer without a big running game at his disposal as it is no coincidence his worst two games of a pro came the last two weeks without Elliott. While backup Alfred Morris is a solid player, he does not possess the home-run ability of Elliott and so opposing defenses can play him in a manner much looser than before. Add in the offensive line woes and Prescott is now looking like a clear bench option in single-passer leagues as the playoff weeks move closer. The timing is terrible of course given the fact Prescott's owners were happy and riding him in September and October but what has gone on the last two week is beyond nasty. BE SURE TO GET YOUR COPY OF THE FANTASY SPORTS BOSS 2018 FANTASY BASEBALL DRAFT GUIDE TODAY!!!! Wow. An illness of all things will likely keep New York Giants emerging wideout Sterling Shepard from suiting up on Sunday versus the Kansas City Chiefs according to ESPN's Adam Schefter. The absence will thus rob Shepard's fantasy football owners of an excellent matchup against a very leaky Chiefs secondary and thus present a late lineup hole to fill. Yours truly is dealing with such a problem and my initial solution was to grab Cincinnati's Brandon LaFell as a stopgap in figuring A.J. Green will be bottled up a bit by Broncos QB Aqib Talib. Either way, this is not the way owners of Shepard want to begin the Sunday action. Here are the fantasy football Week 11 QB rankings based on opposing matchups. Yes we all run for the hills when we hear the name "Tom Savage" when it comes to the twisted world of fantasy football but we are also in the business of presenting to you untapped potential sleepers that can help the DFS crowd and those looking for help as the bye weeks wind down. That brings us to the Houston Texans and specifically wideout Bruce Ellington who all of a sudden looks like an interesting value play for Week 11 based on a number of key reasons. While the shortcomings regarding Savage are ugly and obvious, the fact of the matter is that ace Texans wideout DeAndre Hopkins is going to have his hands full with top Arizona Cardinals cornerback Patrick Peterson this week and that means more targets for everyone else. Right at the top of this list should be Hopkins' counterpart Ellington who will replace the injured Will Fuller for this week's game and thus be a highly-targeted outlet for Savage in the short-to-intermediate range. The word has not really gotten out here as well which makes Ellington even more of a potential find this week. So while the numbers may not jump off the statistical map, Ellington is well worth checking out due to the solid short-term upside. When the Pittsburgh Steelers offense is running on all cylinders, it is a thing of beauty and this is what we all witnessed Thursday night when Ben Roethlisberger and company went to town on the Tennessee Titans. Meanwhile it was another horrid game for DeMarco Murray who looks like he needs to take a seat. Let's get to all the relevant fantasy football results that ultimately came out of the game. -While he had played well of late, the totality of Roethsliberger's season leading up to Thursday night's game was overly disappointing and even more so when you take into the fact that he has arguably the most awesome collection of offensive weapons at his disposal. It all came together Thursday night as Big Ben completed 30-of-45 passes for 299 yards with 4 TD's and even 10 yards rushing. This is what Roethlisberger is fully capable of on a weekly basis and the Steelers using the no-huddle seems to unleash his best. With another decent matchup in the Green Bay Packers on tap for Week 12, Roethlisberger should be fully back in the circle of trust. On the other side, the Titans' Marcus Mariota was simply dreadful as he tossed four interceptions as part of his 22-of-33 day for 306 yards. While he did toss for one TD and rush for another, Mariota simply can't be depended on outside of two-passer leagues and overall it is a giant step back for him after an emerging 2016 campaign. -The Titans really need to strongly consider benching DeMarco Murray so that he can heal up from his myriad injuries. We said back in the summer to avoid Murray given his age (29) and the fact he came off a very heavy workload in 2016 and we are seeing why. Simply put, Murray has been terrible and last night he rushed for just 10 yards on 8 carries. He did help a bit in PPR by catching 5 balls for another 37 yards but Derrick Henry (32 yards on 7 carries) needs to be given more leash. At the very least, Murray needs to be benched in all standard setups. As far as the Steeler's Le'Veon Bell is concerned, the game plan centered on the pass which is why he got just 12 carries for 46 yards (and narrowly missed a running score). However Bell was terrific on the receiving end as he hauled in 9 balls for 57 yards to secure a very good night in PPR. While the overall numbers on Bell have fallen below expectations, he still is without peer at the running back position. -Speaking of without peer, we have known for awhile that was the stats of Steelers wideout Antonio Brown at the position. What he did last night was silly as Brown caught 10 passes for 144 yards and 3 touchdowns. The third score got former New York Giants Super Bowl hero David Tyree up off his couch cheering for sure as Brown snagged the ball against the side of his helmet as he stayed in bounds to collect the score. Tremendous stuff and it is a reminder that there is Brown and then there is everyone else among the wide receiver hierarchy. With regards to the supporting cast, JuJu Smith-Schuster added 4 catches for 47 yards which keeps him in the WR 3 mode for PPR formats but Martavis Bryant (2 catches for 30) remains an enigma. On the Tennessee side, Delanie Walker led the way as usual with 6 catches for 92 yards but he somehow dropped a gift of a touchdown pass that had to have his owners banging their heads against the wall. Also Corey Davis just can't seem to get going as he caught just three passes for 27 yards. Keep the faith here however. While it didn't get the same type of attention that the unexpected breakouts of Scooter Gennett or Justin Smoak engendered, there was no denying the surprising and at the same time shocking offensive performance of Houston Astros utility ace Marwin Gonzalez in 2017. Known more for his glove and ability to literally play all over the diamond than anything he did with the bat prior to the start of last season, Gonzalez wound up setting career-bests in runs (67), RBI (90), homers (23), and batting average (.303). Add in 8 stolen bases and eligibility at virtually every spot in the field and Gonzalez had his place secured on the "All-Value Team" for 2017. Perhaps Gonzalez began hinting at this type of ability the year prior when he posted a 13/12 split in the home run/steal columns but no one could have possibly foreseen him blowing way past any sort of previously established norm. The fact he turns just 29 in March does place Gonzalez in the beginning of his prime years which could legitimize the breakout to an extent but the best course of action is to not pay for the career year. Instead simply embrace the fact Gonzalez qualifies everywhere but third base for 2018 fantasy baseball and place his baseline at around 15/10/.280. Anything above that should be treated as a nice bonus. After months of exhausting and very annoying appeals when it came to the six-game suspension of Dallas Cowboys running back Ezekiel Elliott for domestic violence, the decision was made by the player himself on Wednesday to no longer challenge the case in court. That means Elliott will miss the next five games for Dallas which wipes him out for all but Week 16 in terms of fantasy football. Of course Elliott's owners need to continue holding him in hoping they get the chance to throw him back out there against Seattle in Week 16 but making a play for him in a trade is also an interesting idea as well. Consider a scenario where the Elliott owner is in pure panic mode right now in trying to keep their team afloat and they get a low-ball offer of let's say Orleans Darkwa or Duke Johnson for him. If you are on the border of the playoff picture in your league, you do that deal in playing for tomorrow and not weeks from now. So if you are a team in good playoff standing, making a play for Elliott is a smart move and could net you a first-round talent when the stakes are the highest. Yes there should be some rust and Seattle's defense is no picnic but the bottom line is that Elliott will be a factor once again in a few weeks. Try and get your hands on him before then. The Seattle Mariners made yet another in what has been an endless string of trades during the last two years when they added 1B/3B Ryon Healy from the Oakland A's late Wednesday for RHP Emilio Pagan and infielder Alexander Campos. Healy figures to slide right into the first base spot on the Mariners that will be vacated by free agent Yonder Alonso and he certainly has power to offer as he comes off a 25-home run campaign in 20167. Turning just 26 in January, Healy has some hitting approach warts however; which primarily center on a severe lack of walks (just a laughable 3.8 BB/9 a year ago) and his 235 K/9 rate is nothing great either. Be that as it may, Healy is certainly a backup 1B/3B for 2018 fantasy baseball mixed leagues and he carries decent starting status in AL-only formats. Solid but unspectacular is the word here. It was a lively day in the QB world on Wednesday as two changes were made in preparation for Sunday's and there are some fantasy football ramifications that go with it. First came word the Arizona Cardinals would go with third-string QB Blaine Gabbert since backup Drew Stanton is dealing with a knee injury. Then later the Buffalo Bills announced that Tyrod Taylor would be benched for rookie Nathan Peterman despite the team being 5-4. Let's tackle each one in terms of the impact on the skill players involved. Arizona: Boy have things gone completely off the rails for the Cardinals who are absolutely decimated with injury. Going with Gabbert and his noodle arm is never a good thing for those wideouts and runners who make up the rest of the offense and so that means more bad news for Larry Firtzgerald, John Brown, Adrian Peterson and company. Fitzgerald is the only one who we would still sign off on starting in a WR 3 sense given his slot position and how inferior QB's like Gabbert use him as a safety outlet. Peterson comes off a brutal Week 10 performance and he will continue to see 8 men in the box which is trouble. Consider him right on the RB2/3 border. Buffalo: It is ridiculous how the Bills have treated Taylor; who while he does have faults; is also a competent enough to win games for you. New head coach Sean McDermott is obviously not a fan and he is now risking possibly playoff contention by going with the green Peterman who looked terrible in the preseason. While running back LeSean McCoy seems matchup proof, wideout Kelvin Benjamin may need to be benched this week as we watch to see how Peterman performs in Sunday's game. Rex Burkhead: Burkhead has been trending up the last few weeks as Mike Gillislee has fallen completely out of favor in the crowded New England backfield and Sunday night we saw the versatility as he scored on a pass reception and also has helped in the running game. This is a FLEX play all the way though as Dion Lewis prevents RB 2 status. Jamaal Williams: We already delved in on Williams yesterday so nothing new to add here. Williams is a pure power back who will pick up tough yardage and be in line for goal-line scores with little in the way of receiving numbers. Corey Coleman: While he is not worth starting this week due to likely having to face ace CB Jalen Ramsey, Coleman has tremendous physical talent but who has become a forgotten man due to numerous injuries. Samaje Perine: Rob Kelley is hurt AGAIN and so that means Perine is in line for a nice rushing workload this week versus the New Orleans Saints. Chris Thompson will take most of the receiving numbers though so this is strictly a standard league play. Arizona Defense: Anytime you get to face awful Houston Texans QB Tom Savage, it is a win-win deal. Latavius Murray: The Minnesota Vikings seem set on giving Murray the majority of carries and especially goal-line work over the shifty Jerrick McKinnon and so anyone in need of a short-term help can benefit here. The mantra "next man up" has certainly been the theme of the injury-ravaged Green Bay Packers so far during the course of the 2017 fantasy football season. Not only has the team lost star QB Aaron Rodgers likely for the year with a broken collarbone, the running back corps has been torn apart with health woes as well. This point was driven home this past Sunday when first rookie runner Aaron Jones was carted off with a knee injury and then was followed by Ty Montgomery exiting with another rib injury. Both Jones and Montgomery are long shots to play in Week 11 and so that leaves rookie BYU product Jamaal Williams as the last man standing. Replacing Jones and Montgomery Sunday. Williams was not very impressive as he picked up 67 yards on 20 carries; while also adding one catch for 7 more yards. Nothing earth-shattering by any means but Williams will likely be a bellcow back in Week 11 which should make him a popular add in most fantasy football leagues. Even going back to his BYU days, Williams was known primarily as a plodding power runner who lacks flash and doesn't do much in the receiving game. That makes him more of a standard league priority, while in PPR we would prefer Rex Burkhead or Danny Woodhead as a better waiver pick. Jacksonville Jaguars wideout Marqise Lee will start Sunday for the team versus the Los Angeles Chargers despite having been listed as questionable with a knee injury. Analysis: Lee has been a nice PPR play this season as he graduated into the number 1 target role for QB Blake Bortles. While the touchdowns will never be impressive, Lee has earned the right to be a weekly play in fantasy football. Get him back out there in a nice matchup versus a leaky Chargers defense. Washington Redskins slot wideout Jamison Crowder will start Sunday for the team versus the Minnesota Vikings despite drawing a questionable tag with a hamstring injury that cost him Week 9. Analysis: Good news here as Crowder has very good PPR potential given the fact QK Kirk Cousins is still trying to nail down a number 1 wideout on the team. Crowder can be that guy and pile up the receptions like he was starting to do before the hamstring went bad. Pick him up where available. Dallas Cowboys wideout Dez Bryant will suit up and start for the team for Sunday's game versus the Atlanta Falcons despite being hobbled by knee and ankle injuries leading up to it. Bryant missed all but Friday's practice this past week but he pronounced himself feeling good after the session and overall he should be a firm WR 1 play in a game that is expected to be a shootout. Analysis: Bryant has earned more trust from QB Dak Prescott this season and so his numbers have seen a nice uptick after floundering a year ago. He is still capable of WR 1 production on a weekly basis but the dynamic Bryant from 2015 seems to be a thing of the past due to all the recent injuries. Here are the fantasy football Week 10 running back rankings based on opposing matchups. It was a big Friday practice day across fantasy football as Week 10 Sunday approaches. Some big names returned to practice during the day and that helped to clear up a few of their statuses before the games kick off. Let's get to the latest. -Atlanta Falcons ace wideout Julio Jones returned to practice on Friday after sitting out every previous session this week due to what is believed to be a high ankle sprain. This bodes very well for Jones to be out there at the start in the team's expected shootout versus the Dallas Cowboys. While Jones continues to frustrate with his crazy inability to score, his very high volume of catches makes him a firm WR 1 in all formats. -Also returning to practice on Friday was Cowboys wideout Dez Bryant. Battling his own ankle sprain and also a knee injury, Bryant reportedly "moved well" according to a team reporter and even included a one-handed catch. That makes it a good chance Bryant will suit up but have Terrance Williams close by just in case. -Denver Broncos wideout Demaryius Thomas was removed from the team's injury report after he missed practice earlier in the week with a tweaked hamstring. Like with Julio Jones, Thomas is one of those guys who always seems to be battling some sort of injury. The big problem here of course is the fact Thomas has seen some of the worst QB play in the league the last season-plus and things are not looking to be any better this weekend with the awful Brock Osweiler under center. -You can safely scratch New England Patriots wideout Chris Hogan from your lineups in Week 10 as his injured shoulder is simply not ready yet for him to return to action. Hogan has been straddling the WR 2/3 line all season but his recent work has been shaky even before the injury. -Both Washington Redskins wideout Jamison Crowder and tight end Jordan Reed draw the questionable tag this Sunday, with Reed looking like the more iffy proposition in terms of whether he will go or not. That means backup Vernon Davis will be another excellent streamer this week, while Ryan Grant is the backup option in PPR formats for Crowder. -Matt Forte has been ruled out for Sunday by the New York Jets due to a knee injury and that means backup Bilal Powell and third-stringer Elijiah McGuire will split reps in Sunday's game versus the Tampa Bay Buccaneers. Powell is arguably the best backup running back in football and he can be a seriously good PPR back when he gets the carries as he should in this one. Play him as a firm RB 2. -Tennessee Titans tight end Delanie Walkeri s once again listed as questionable with an ankle injury but the fact he got some work in on Friday means he will likely be out there. Already one of the more underrated tight ends in the game, Walker is in the TE 1 mode this week. What a difference a month makes. A 4-0 start for yours truly in the Fantasy Sports Boss Fantasy Football PPR Experts League has now devolved into a 5-4 struggle which coincided with losing QB Aaron Rodgers likely for the year with a broken collarbone. Losing four out of five is enough to test the patience of any owner but the beats have been severe and frustrating as well due to other injuries/underperformance. Since the last time I updated you on my team (which was 4-2 at the time), I have made a series of moves to try and hold the fort for the stretch run. Now taking a top two seed (and a first round playoff bye) is pretty much over and instead I am focusing on just getting into the top six (I have one more win than the first team that is currently out of the playoffs). Prior to my last post on my team, I was riding Ben Roethlisberger as my QB stoppage after dealing away Ty Montgomery the day Rodgers got hurt. Well since then I have traded Big Ben, Jeremy Maclin, and Chris Hogan (prior to getting hurt) in a deal for Sterling Shepard and Matt Ryan in buying low on Ryan who has excellent playoff week matchups and Shepard who is now the top wideout in NY for the Giants. In addition, I traded Packers running back Aaron Jones straight up for wideout Keenan Allen (before Jones laid an egg in Week 9) and also flipped Mark Ingram straight up for Dez Bryant. So my once very weak wideout corps (led by the brutal off-year of Mike Evans) now has Bryant, Evans, Allen, and Sheppard which works nicely. Also Ryan played well last week and still has nice weapons around him. Of course my running back depth has been depleted after dealing away Ingram and Jones and so I have to go with Orleans Darkwa this week who has an excellent matchup versus the San Francisco 49ers who have given up the most points to back this season. As far as the rest of my roster, Zach Ertz missing last week with injury really screwed me bad and replacement Austin Hooper has been nothing special. I did pick up Danny Woodhead off waivers with an eye toward Week 11 in this PPR format and also have the upside of Marlon Mack and wideout Corey Davis on my bench. All could be factors before too long. Finally, I dumped the Denver Broncos defense which has been a huge bust and picked up Detroit who has a series of great matchups on tap going forward. So this is what my taking on water 5-4 team has now. It has been a struggle but I think I can make it into the playoffs and it is always a new game from that point onward. How do you think I am shaping up right now? Honest answers please.